Boy, do I have a great recipe for you today! brought this yummy Cinnamon Bear Popcorn to my house. And I’m not even whistlin’ Dixie. 1. Pop up your popcorn. Sprinkle it with just a bit of salt and set it aside. 2. Snip your cinnamon bears up with a pair of kitchen scissors. Have I mentioned before how handy scissors are in the kitchen? They make projects go so much faster. I’m not against knifes or anything. Wouldn’t want to get on the bad side of a knife at all, actually. Just saying that kitchen scissors are a great way to speed up the cutting process. They too, are The Bomb Dot Com. 3. In a medium sized sauce pan combine the butter, corn syrup and sugar. Heat it over medium to a boil. Reduce heat to low and cook for 5 minutes. 4. Remove it from the heat and add your vanilla, marshmallows and red food coloring. 5. Isn’t that a fun pretty color! You could of course add more food coloring for a darker pink. Mix it all around to get everything melted in and combined. 5. Stir in the bears. 6. 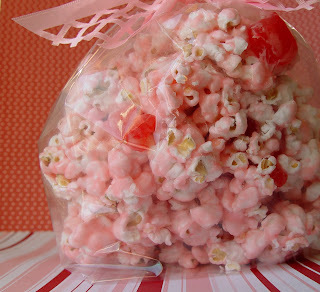 Add the mixture to your popped popcorn. Stir it all around until well combined. Makes a pretty little gift! PS…if you want to eat it all yourself, I won’t tell anyone. You would still be The Bomb Dot Com in my book. If I can't find the cinnamon bears, what would you suggest I substitute? Regular gummy bears? Cinnamon gum drops? Thanks! I love it! Dear Hubby is going to go wild over this! He's a Cinnamon Bear freak! This recipe will be perfect to take to our Cousin Movie night (the cousins are also Cinnamon Bear freaks)! thank you so much for picking me to win the Visa gift card, I am truely thankful. Its been a rough year and this will help tremendously. I love your site and frequent all the time. You have a great sense of humor and I just love your pictures. Happy Holidays to your family! I love the PINK!! So pretty! You are most welcome. Glad I had the opportunity to pass it on to you! Thanks for reading! If you can't find the cinnamon bears I would suggest cinnamon flavored gum drops…just regular gummy bears wouldn't be nearly as good. Good luck! Hi Jamie – I love your blog and stalk, I mean check, it daily! For this cinnamon bear popcorn, do you have to spread it out and let it dry in the oven on cookie sheets before packaging? I am hosting a recipe swap this weekend and this is going to be the “favor” for everyone coming! LOVE that pink ribbon! Thanks for sharing so much of yourself on your blog – I appreciate it! So glad you are enjoying my site. Thanks for reading. This popcorn is gooey, but will package well about 15 minutes after it has been made. I believe I just let it sit in the bowl before I put it into bags. It is sticky…but it doesn't really get too clumpy. Does that make sense? Good Luck! Hope your party guests love it! This looks so good! Will microwave popcorn work ok for this? I do believe you could use microwave popcorn. I would stick with maybe the lower butter choices, as the recipe calls for so much butter. Let me know how it goes! 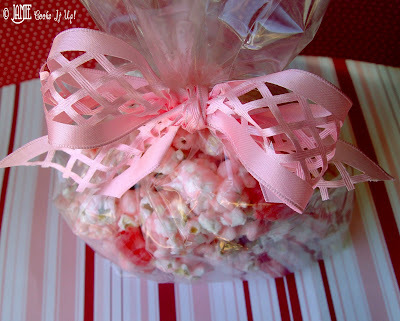 I love the idea of cinnamon candies with popcorn! We didn't have cinnamon bears here so we tried it with hot tamales. It was great and everyone loved it! Thank you! Thanks for this awesome recipe. My dad loves cinnamon Bears and popcorn so this was the perfect treat for him. Thanks for posting such good recipes! I have loved them all! This looks amazing! I would love it if you could place your recipe at the end of your instructions in a printable format! Thanks!! If you look under the title of the recipe, just before the ingredient list you'll notice the words “PRINT RECIPE”. This will take you to an all white page, with only the written recipe that you can print. I just had to write and let you know that I made this the other day to put in a care package for my husband who works 8 hours away in another state. It was DELISH! And easy to make! My only struggle was stirring it, but I think I moved too slowly after I poured it over the popcorn. I LOVE chocolate covered cinnamon bears, so I drizzled some melted milk chocolate over half the recipe as well. WOW!! It was wonderful with the chocolate and without! My husband loved it too! Thank you!! Love your blog! I want to make this with my daughter’s kindergarten class but we only have a microwave to “cook” in. Do you think it would work in a microwave?